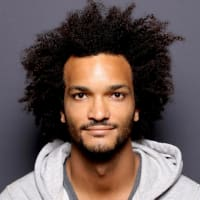 This is my (fledgling and abandoned, due to general lack of efficiency) mobile-only script development workflow (full post here). Last summer, I went on a road trip, and wanted to experiment with a mobile-only workflow. The main components I needed were an interpreter, an IDE, and source control. 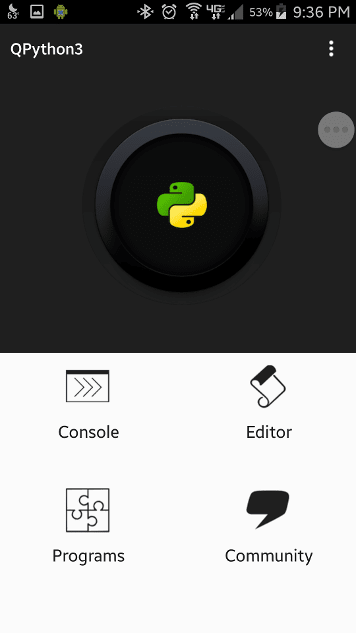 In this tutorial, I will cover my experience with QPython3. 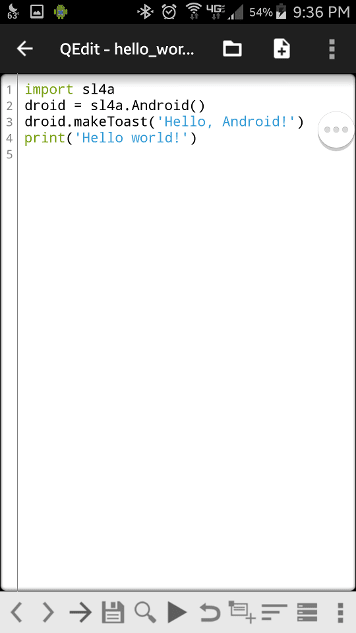 Select Programs > hello_world.py > Open to view the script contents. Super standard python3 here. 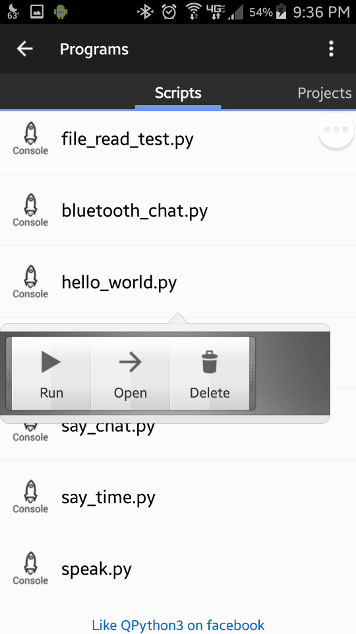 The script uses the SL4A library (Scripting Layer for Android) to show an Android toast, then prints Hello world! to the console. Click the right-arrow on the bottom toolbar of the script editor screen to run the script. You can also back out of the editor, click hello_world.py again, and choose Run. Play around with some of the other default scripts if you like. To see some of the SL4A library functionality in action, run test.py to run a series of tests on various sensors and UI elements. It will demo a few things like text to voice, various form input elements, and progress bars. 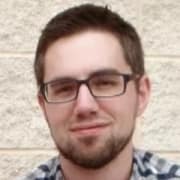 Demo Qpython3 App - Item Name Generator! 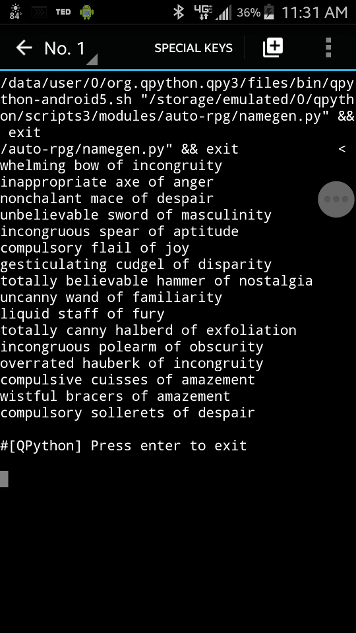 Now that you're able to execute python scripts on your Android device, let's do the only logical next thing: write a short fantasy equipment name generator script. First, we need to load the file contents. I wrote a quick loadfile function, which takes a filename and returns a list of strings contained in the file. Each line in the loaded file will be stored as a separate string in the list by splitting on newline, or \n. This will let you run the script on other devices, such as a Linux VM. Step 1: Load the files. Import the loadfile function from our fileutils module. 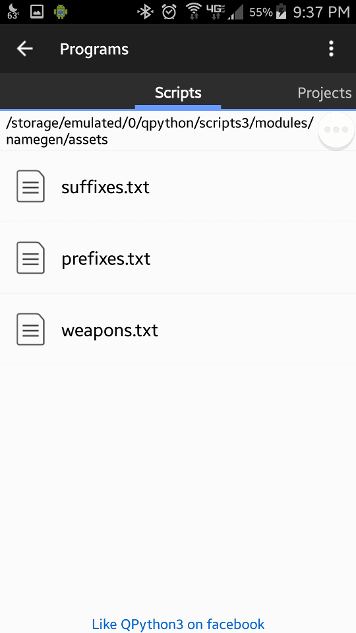 Step 2: Invoke loadfile to create a weapons list, then print it out to verify. Step 3: Invoke loadfile for the prefixes and suffixes. 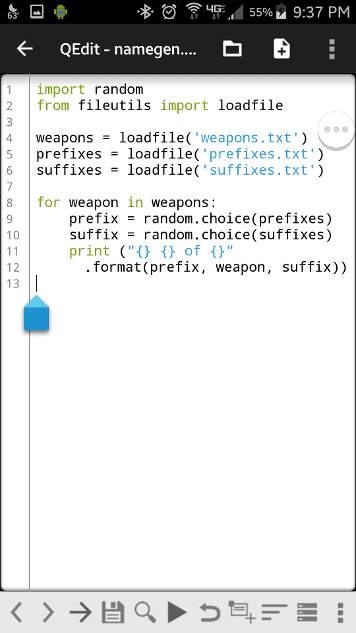 Step 4: Finally, loop through the weapon list, select a random prefix and suffix, and print out the combination. Don't forget to import the random module. 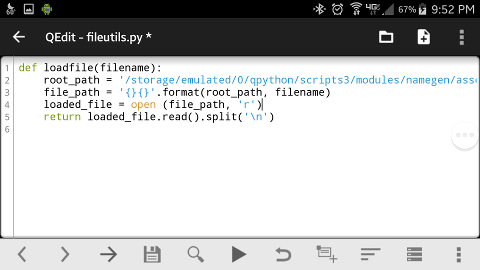 You should now be familiar with writing and executing python modules on your Android device! Add your own prefixes, suffixes, and weapons to roll your equally awesome counterparts to such legendary names as satisfactory cuisses of pain, repressed flail of efficacy, and gesticulating bow of obscurity! Nice article, you can also try Termux. 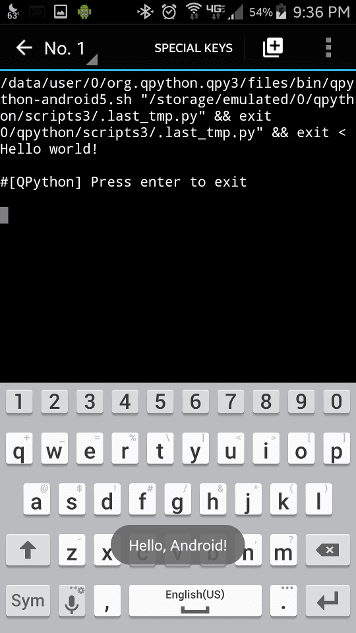 It is a terminal emulator for Android so one can install python, vim, git and other command line tools.